Your Oregon Coast dentist, Dr. Scott Santos knows that chronic stress has become a daily part of modern life for many of our patients, but for millions of Americans it also ranks as a primary cause for a variety of physical and mental health disorders. Studies have shown that chronic stress increases your risk for heart problems, immune disorders, dementia, depression, and anxiety. Stress can also have a major impact on your oral health, increasing your risk of TMJ problems, tooth grinding, dental decay, cavities, gum disease, and tooth loss. If left untreated, excessive stress can even be deadly. Work-related stress results in 10 percent of all strokes, increases the risk of heart disease by up to 40 percent, heart attack by 25 percent, and decreases brain mass, according to researchers. Approximately 44 percent of Americans feel more stress today than they did 5 years ago, according to the American Institute of Stress (AIS). This increase in daily stress makes the managing of stress even more important than ever for many people. In her bestselling book “The SHARP Solution and Stressaholic,” Dr. Heidi Hanna, executive director of the AIS calls stress a silent killer. “People who experience chronic stress not only have an elevated risk of cardiovascular disease but experience decreased immune functioning, increased rates of depression, impaired sleep, poorer short- and long-term memories, and decreased cognitive performance,” noted Dr. Hanna. In fact, one recent study found that adults suffering from high levels of stress performed 50 percent less effectively on certain cognitive tests compared to adults experiencing lower stress levels. “Physically, stress also causes the body to produce a cascade of hormones that increase the appetite and compel us to crave high calories, high fat foods,” explains Hanna. In the workplace, the cost of stress-related illnesses and issues has reach $600 billion a year in the U.S. Weekend headaches. A sudden drop in stress levels – such as what many people experience during the weekend – can trigger migraines, explain researchers. To prevent these unwanted headaches, try adhering closely to your weekday eating and sleeping schedule to minimize any potential triggers. A sore mouth. A sore jaw can be a sign of nocturnal teeth grinding, a condition that can be worsened by stress, according to the American Dental Association. 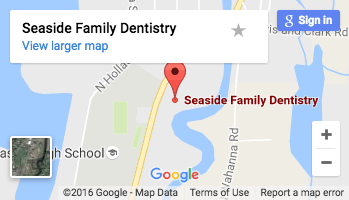 If you often wake up with a sore jaw or aching teeth, talk with your Seaside family dentist about potential treatment options. Nightmares. When you suffer from severe stress, you end up waking more frequently at night, allowing unpleasant dreams to bubble up. To enjoy a more restful night’s sleep, try avoiding caffeine or alcohol before bedtime. Bleeding gums. Patients suffering from stress have a higher risk of developing periodontal disease, finds a recent Brazilian study. Increased stress hormone levels may impair immune system function, allowing bacteria to attack gum tissue. If your gums bleed easily, you need to brush and floss more frequently, while also scheduling more regular appointments with your Seaside family dentist. A sweet tooth. A recent University of Pennsylvania study found that stress can trigger chocolate cravings. The more sugar consumed the higher the risk of tooth decay and cavities. Stress can have a significant impact on your oral and overall health. Don’t let stress make your life even more difficult by leaving the condition untreated. Talk with your doctor or Seaside family dentist about the best ways to successfully lower your daily stress levels in order to protect your health.